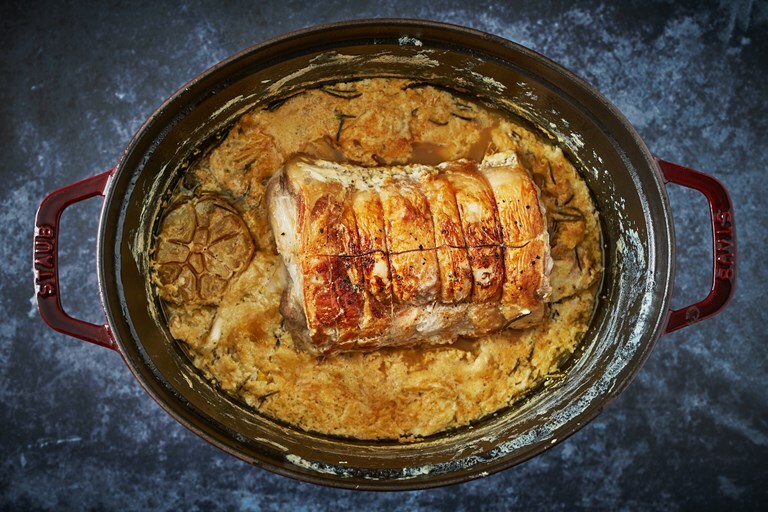 While it's not the most appealing dish to look at, this classic milk-braised pork loin recipe is beloved throughout Emilia-Romagna. As the pork cooks the milk separates into curds, soaking up the meat juices to create something very delicious indeed. Add the garlic, lemon zest and herbs to the pan then top up with the milk. Adding the lemon zest splits the milk into curds and whey which does look a bit unappealing, but don't be alarmed, it tastes delicious! Whilst the pork is resting, you have time to prepare the sauce. Pick out the whole herbs, zest and garlic, then strain the sauce into a clean pan, reserving the curds. Place the liquid back over the heat and reduce to a thin gravy consistency.